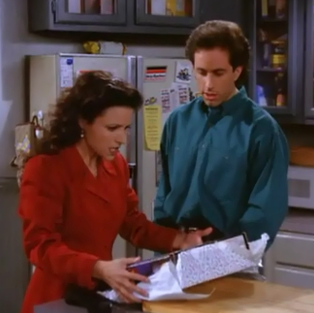 The holidays are busy and stressful so let’s lighten things up and talk about regifting. I think my first memory of a regift was when I was seven. My grandma had gone to all of the banks and stores in the area collecting pencils throughout the year and gave my brother and I each a bunch wrapped in curling ribbon. One had a John Deere Logo, another a local grocery store emblem. My brother and I exchanged bewildered looks and moved on to the next gifts; chocolate covered mints and a check for $20. (Internal sighs of relief) We thanked her and my grandpa and thank you notes were mailed within a day or two. Come on, we were a little spoiled, I’ll admit, but we weren’t complete a-holes. My other grandma was guilty of regifting on a much grander scale. In fact, it became somewhat of a joke with one of her “gifts.” One year she decided to wrap up an old coat my grandpa used to wear and gave it to my dad. Now, keep in mind that this coat was probably 20 years old and, living on a farm, it had its fair share of stains and rips too. Still, for some reason my grandma thought it would make the perfect gift. The coat was secretly exchanged between my dad and his brother-in-law…until one year they were not so discreet, my grandma found out and that was the end of the brown, shabby coat. Recently, I received a gift from a student where I volunteer. I am guessing my student (or the mom?!) went through the house and found something a teacher might like and decided to bring it in which is pretty cute (if it was the kid, but a little crazy if Mom did it). The gift made no sense and in the interest of discretion I will not divulge what it was, but I had to smile when I opened it because it reminded me of the regifts of Christmas’ past which prompted this post. Maybe I am not using the term ‘regift’ correctly. 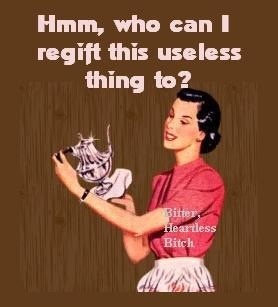 Usually a regift is something you received originally as a gift, but did not care for so you passed it along to someone you think would appreciate it. Were the gifts above repurposed? I don’t think there is a correct term for what those were. We might have to make one up like Seinfeld did on the label maker episode. Thrifty-gifty, Junkyard Santa, Mrs. Claus’ Nightmare Knick Knacks, Gingerbread House Leftovers, Closet Purge Presents or Gift Imposter. Thoughts? Let me clarify regifting a little further. If there is a gift that is in mint condition and relatively new, then by all means pass it on to someone who might appreciate it and possibly with the disclaimer that it’s not a gift, but more of an extra. A few of my friends and family have done this and I have loved what I received: a Coach purse, a silverware organizer, gloves, shirts, the list goes on. That’s spreading the love and definitely not regifting. So now I leave it to you readers, I’m sure you all have at least one good regift story to share. I can’t be the only one to experience the gamut of emotions, from being excited to open the gift, then puzzled, followed by starting to get a little pissed off and finally laughing about it later.